The best way to get your emails answered. Research has shown that the more you follow-up, the more of a chance you have for a 100% response rate. 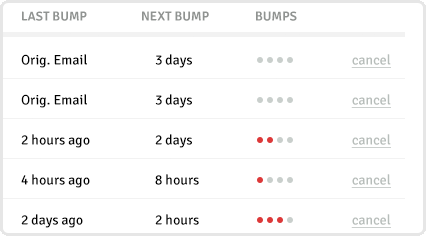 Rebump makes the most of every email you send. If your recipient doesn't respond, you've missed an opportunity. Don't let another one pass by. 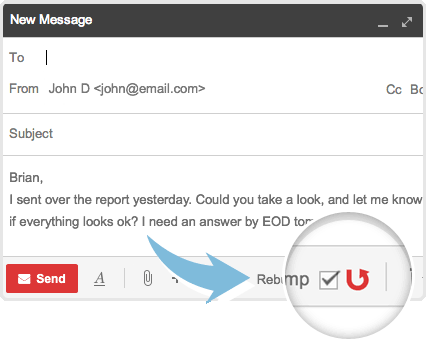 Simply click on the Rebump checkbox on emails that you'd like us to send follow-up emails for you. What if I'm on a mobile device? You guys are seriously undercharging. I'm scared to tell you how much money you've helped me make in the past few months! I've been able to rescue 44% of emails that would have gone by the wayside. One current client said "You're persistent," and ended up signing up for my services after the 3rd bump. It's amazing. I would rank it in the top 5 tools that I depend on every day to be successful in my sales career. If your job is to reach out to decision makers, there is a psychology on how your follow-up needs to be done and Rebump simply and efficiently does it for you. 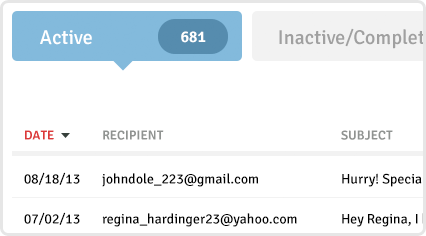 I have been using Rebump to increase engagement with my prospects for a year. When integrating the tool with email marketing programs such as Tout I am receiving 4X the responses per individual email sent. With this tool I am able to focus my time on customers who are engaging me as opposed to the traditional method of running through endless lists. Do You Read My Email? No. 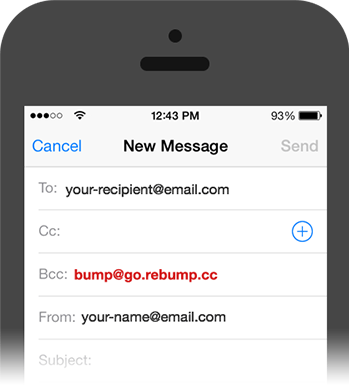 Rebump exclusively analyzes email headers to determine when a reply has been received. The technology that powers rebump is automatic, so no human eye ever has access to email details. Under no circumstances will your emails ever be read or shared. Privacy is our top priority and if you have any question or concerns, please feel free to send us an email at info@rebump.cc. But there's good news, you can still use Rebump! You can still experience Rebump without using any extension. After you've authenticated and granted access to your Google Account, simply add "bump@go.rebump.cc" to the BCC Field of any email you want us to bump for you. Although our Firefox extension isn't ready yet, our Chrome Extension is ready and available. Simply install and open Chrome on your computer, come back to Rebump.cc and click "Add Rebump to Gmail" again.